The next Constituency Commission will be told to provide for a reduced number – reducing the Dáil by about a dozen. THE GOVERNMENT HAS unveiled plans to reduce the number of TDs in the next Dáil – without needing to hold a referendum to do so. 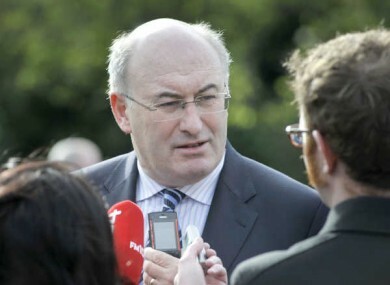 Minister for the Environment Phil Hogan has announced that the next Constituency Commission – which is due to revise the current Dáil constituencies next year – will have its terms of reference changed so that revised constituencies will elect fewer TDs. The commission, which reviews constituencies every five years and recommends boundary revisions depending on population or county boundaries, is currently told to ensure that the total number of TDs is between 164 and 168. While there is no constitutionally mandated set number of TDs, the Dáil is required to have one TD for every 20,000 to 30,000 people in the country. By revising the terms of reference of the Constituency Commission, the number of TDs could be reduced without a constitutional amendment – though the total number of TDs could only be reduced by around a dozen or so. A more precise indication of how many TDs could be shed will be offered when the results of the next census are announced; if the census showed a population of 4.5 million, the Dáil could be reduced to 150 members from the current number of 166. Given that Dáil constituencies tend to be aligned by county boundaries, however, it is likely that the number would be somewhere between 150 and 160. Reducing the numbers to anything lower than 150 or so, therefore, would require a constitutional amendment – and a referendum – to remove the current brackets. The revision of the constituencies, aside from cutting the number of elected parliamentarians, will also see sweeping seachanges in the Irish political landscape, as virtually every single constituency would likely see its boundaries amended. If the terms of reference mandate the commission to reduce the number of TDs to an absolute minimum, irrespective of current county boundaries, many constituencies could be abolished – leaving many so-called ‘safe seats’ up for grabs in the next general election. Hogan told RTÉ’s News at One, however, that the commission would still give regard to county boundaries – meaning the commission will realistically only reduce the number of TDs by ten or so. Fine Gael’s election manifesto included a pledge to reduce the number of TDs by 20, while Labour did not propose downsizing the Dáil. The Programme for Government agreed between the two contained a commitment to reduce the number of TDs, though no specified number was involved. “Irish politics needs to start delivering for the Irish people and this Government is determined to make real, tangible reforms which will make the political system leaner and more efficient for its citizens,” Hogan had said in a statement this lunchtime. Among other reform measures announced by Hogan were a reduction in the spending limit for presidential elections – being reduced from €1.3 million to €750,000 – and the introduction of a new law requiring Dáil by-elections to be held within six months of a seat becoming vacant. Hogan said the latter decision had been motivated by the “farcical situation where political parties are forced to take High Court challenges to ensure by-elections”, which “should never be repeated”. Email “Government unveils plans to reduce number of TDs”. Feedback on “Government unveils plans to reduce number of TDs”.